Le Cap Est is a great place to stay if you’re looking for a quiet beach vacation or the ultimate romantic getaway. 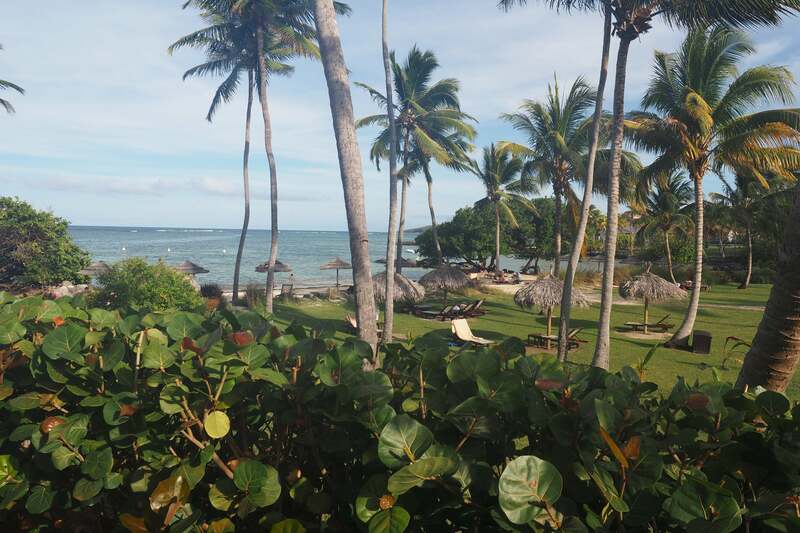 The Pros: beautiful property located right on the ocean, good food and service. The Cons: parts of the resort felt dated. Winters in New York City can get pretty damn cold and I soon found myself wanting to escape to a place where I could spend a few hours outside without getting frostbite. Luckily, I came across a great fare on Norwegian from New York (JFK) to Martinique (FDF) and it turned out to be a surprisingly good flight — you can check out the full review, here. The carrier started flying from the Northeast to the French Caribbean back in 2015 and recently announced it’s going to be expanding service later this year to even more US cities. 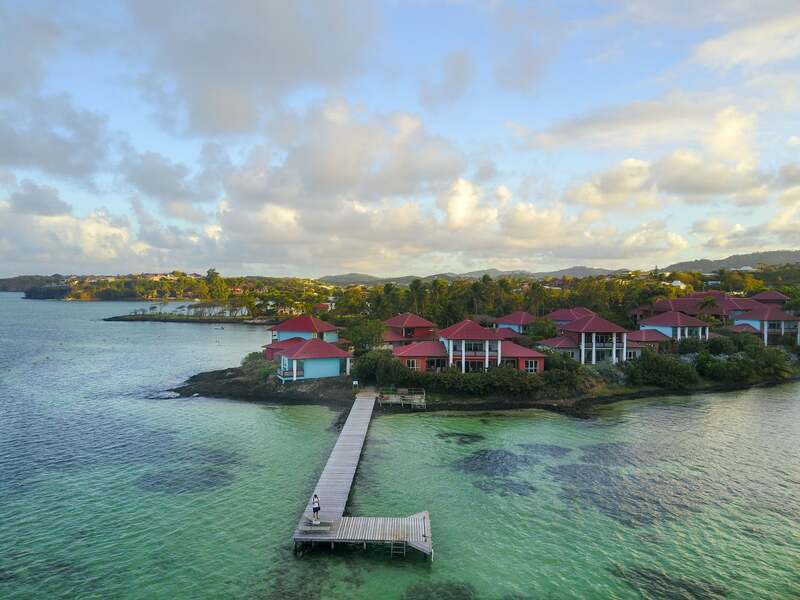 As for accommodations, I was looking for a nice, quiet spot on the beach somewhere where I could really relax and enjoy the warm French Caribbean sun and after some research, I went with Le Cap Est Lagoon Resort and Spa because it seemed to be a great spot for relaxing vacation — and boy, did it deliver. Unfortunately, Le Cap Est is not a points hotel — in fact, there aren’t any points hotels in Martinique — so I wouldn’t be able to redeem any points for this stay. With rates going for about $433 a night including taxes and fees, I turned to one of the most powerful credit card benefits in the game and booked with the Citi Prestige Card so I could take advantage of its nifty 4th Night Free benefit. By booking my stay this way through the Citi Prestige Concierge, I ended up saving $433.72! The Citi Prestige Card also gives me 3x points on hotels, so I also earned 3,903 ThankYou points, which is worth about $62 according to TPG’s most recent valuation. I could have also booked with my Chase Sapphire Reserve Card or the Chase Ink Business Preferred, which also let you earn 3x points on travel purchases worldwide. After landing at FDF, I hopped in a cab that I arranged for the hotel to have there waiting for me since I was unsure of the taxi situation in Martinique — the cost came to €60 (~$69) for the 40-minute drive from the airport. I arrived at the hotel around 8:00pm and was warmly greeted by the receptionist. I was also offered a glass of sparkling or still water as I waited on the couch. As the staff checked me in, they grabbed my bags from the cab and had them delivered straight to the room. The concierge walked me to the door of my room, giving me a quick overview of the property along the way. During the booking process, I’d opted for the Junior Suite with a garden view, but once I got to the room, I realized that I must have been upgraded to a Premium Suite, although it came as a complete surprise — not even the check-in staff had told me about this! 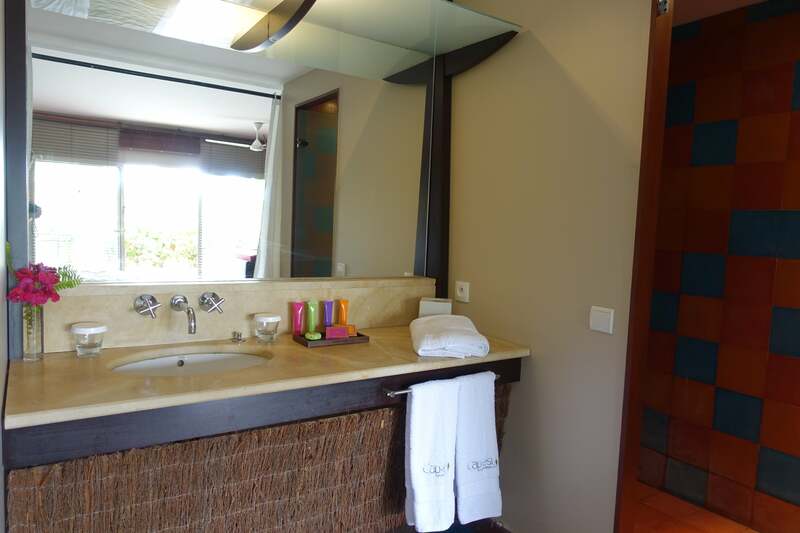 It seems I also received a special room type, since, as I’m writing this review, there doesn’t seem to be a way to even book a Premium Suite through Le Cap Est’s website or through an online travel agency. Note that the luxury level of the Premium Suite is somewhere between a Junior Suite with a garden view (which doesn’t include a plunge pool) and a Junior Suite with a sea view (which does include a plunge pool and outdoor shower) — my room came with a plunge pool but did not have an outdoor shower. 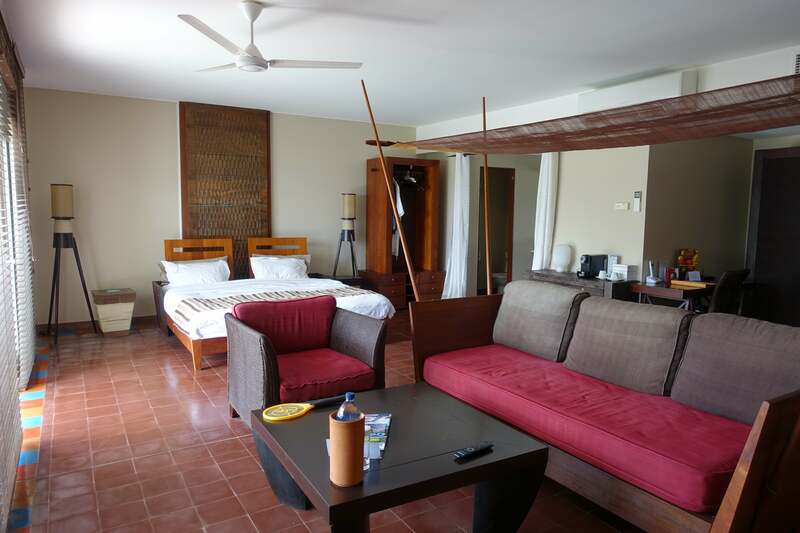 The resort has 49 suites and most of the property is spread out over several acres. In other words, there’s not just one big building that houses all the rooms. Most of the units contain four hotel suites at most and I was in a building with just a few that were attached. 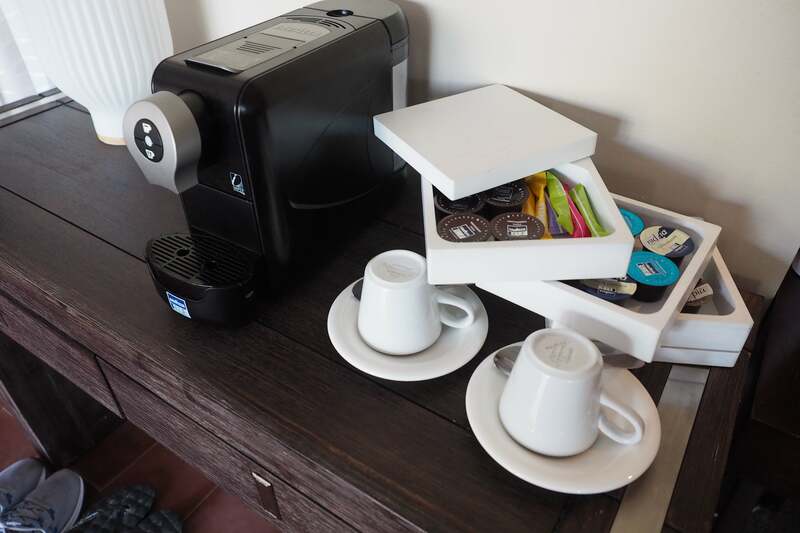 The first thing you notice when you step into the room is the open design and how big it is — approximately 650 square feet, according to the hotel’s website — a decent size for a suite although there’s nothing separating the living room from the bedroom. 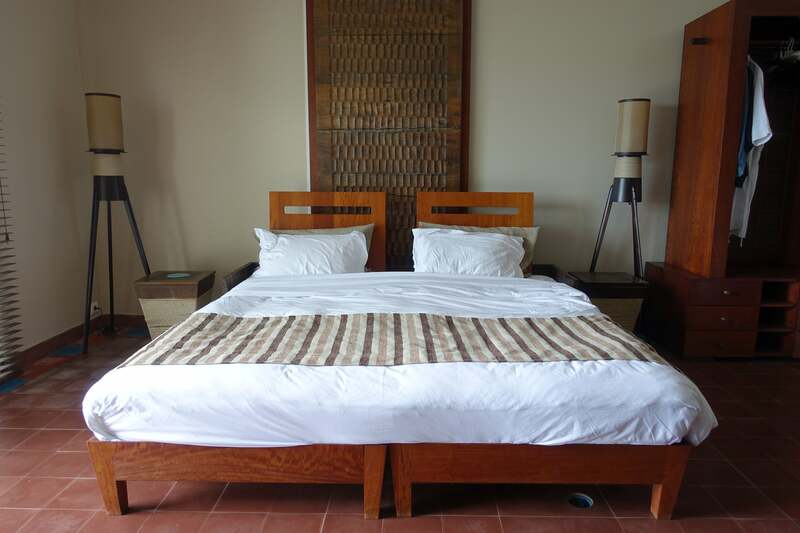 The king-size bed was quite comfortable and I slept like a log every night of my stay. There was a closet next to the bed that came with a nice bathrobe and had plenty of space for me to store my clothes. The sitting area included a couch that looked out into your own, personal garden. There was a flat screen TV equipped with cable — but it was all in French. Although I studied French in high school and college, I spent about 10 minutes trying to decipher a documentary about the former French President Jacques Chirac before I finally gave up. So, if you’re not fluent in French, make sure you bring along your own entertainment — keep in mind if you’re a Netflix or Amazon Prime subscriber, you can download content onto a tablet or mobile device and watch it anywhere. 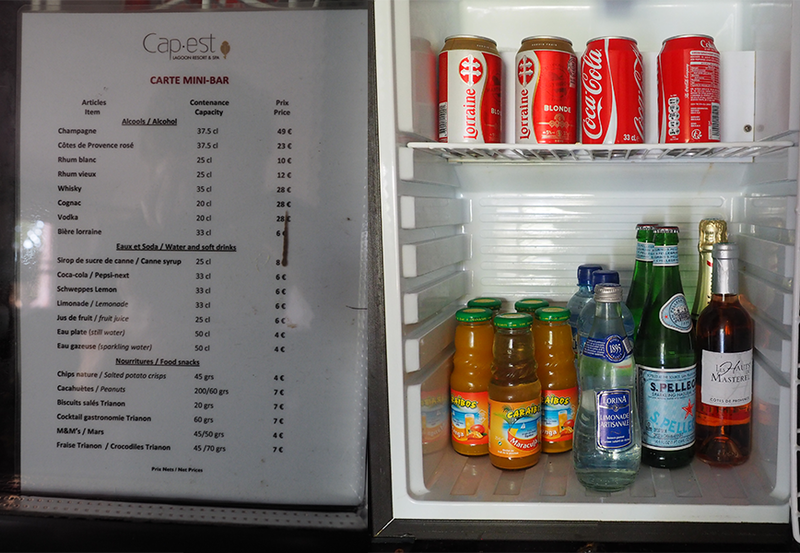 There was an in-room mini-bar, which came with a solid selection of soft drinks and alcoholic beverages, although it was pretty expensive — like 6 euros (~$7) for a Coca-Cola expensive. Spirits were displayed next to the fridge and came with a fresh lime in case you wanted to whip up a quick cocktail. There was also an instant coffee machine, which I didn’t use because I chose to enjoy a fresh cup from the restaurant’s terrace instead. The bathroom was pretty basic and only had one sink. To the left of it was a small room with the toilet, and to the right of it was the shower. 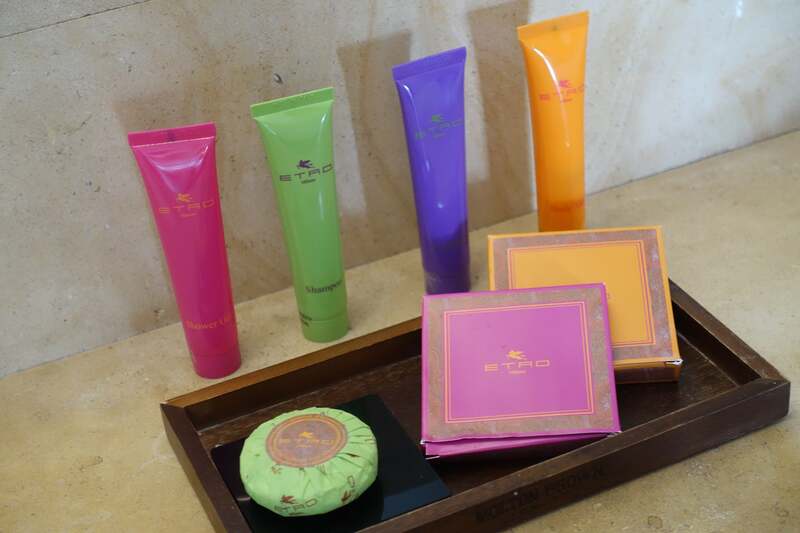 The resort had luxury toiletries from Italian manufacturer ETRO. The walk-in shower was large, but it honestly felt a bit dated. 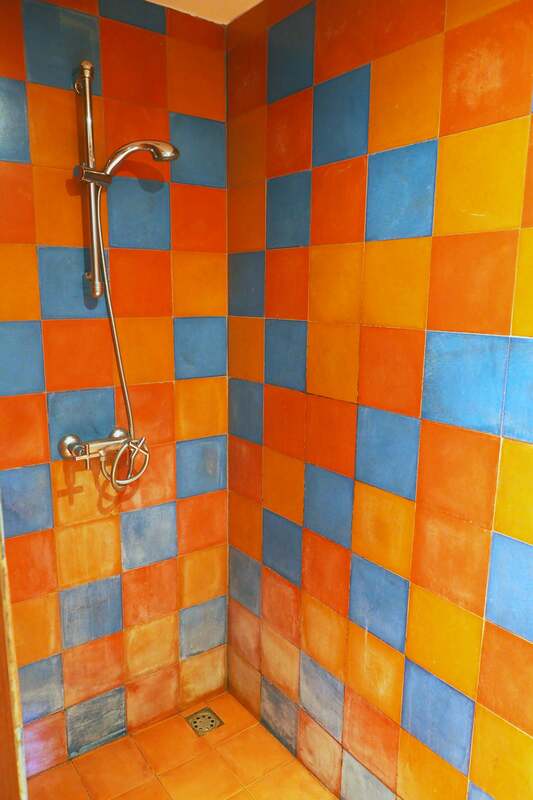 You could see that many of the tiles were fading and considering this is a luxury resort, I would expect there to be a fixed shower head in addition to the small hand held device that was in there. It was also frustrating that the bathroom lacked a tub, although it’s possible that my suite was designed to be handicap accessible. What really makes this room great is what’s right outside the door. Between the plunge pool and beautiful views of the garden, I spent a lot of time out here. The plunge pool was elegant and very refreshing — when I was visiting, it was HOT in Martinique. The water stayed cool day and night, making it a great place to lounge while I was getting some work done. The plunge pool was protected from the outside by a row of shrubs that added a nice element of privacy to the room and made it feel like my own little apartment. Just past the plants and to the right was a small opening in the bushes that allowed you to walk right onto the beach, which was about 50 yards from my room. The only bad thing about my room was that parts of it seemed heavily used. In addition to the aging tiles in the bathroom, there were quite a few fading floor tiles throughout the room and I noticed the varnish on the wooden cabinet and coffee table was starting to come off. Located on Martinique’s east coast, Le Cap Est is a beautiful beachfront property with stunning views of French Caribbean’s turquoise waters. The grounds are lush and full of green gardens and palm trees, as you can see in the Drone video, below. It probably takes about five minutes to walk from the beach to the parking lot since the property is so spread out. I loved the lobby and its open air design. The check-in desk is on the right and to the left is a small gift shop that sells local products like rum and spa/bath items. There are several comfy couches scattered throughout the room as well. One of my favorite parts of the resort was toward the back, where after walking through a tunnel of trees, you’re presented with a dock that extends about 100 yards into the lagoon’s crystal blue waters. The water is warm and shallow enough that you can meander around and while the day away. 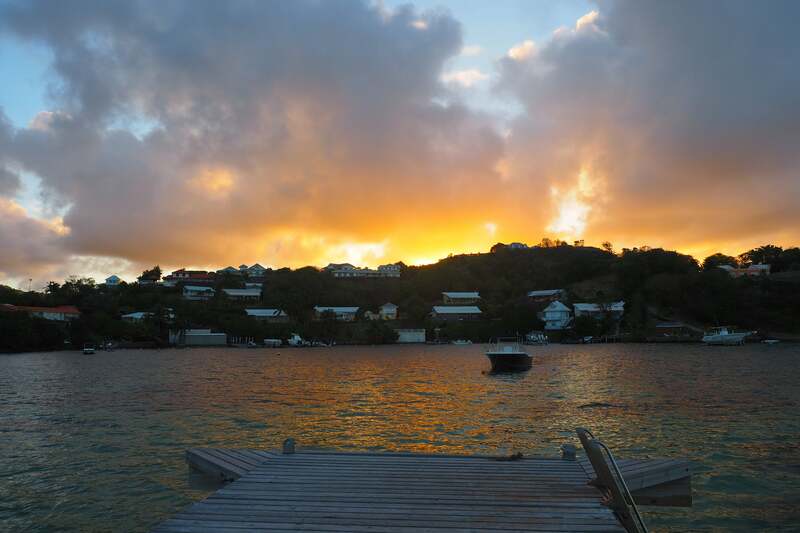 The dock is also a great place to catch the sunset. 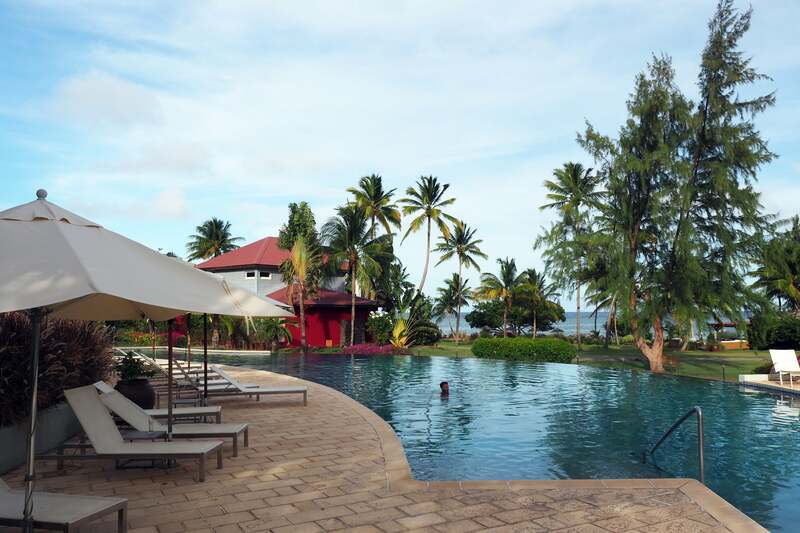 In addition to my personal plunge pool, Le Cap Est also has a large infinity pool that’s built with a large curve; its design flows well with the rest of the resort. There are plenty of lounge chairs, too, so you can spend the day relaxing poolside if you so desire. Keeping with the open air theme of the resort, Le Cap Est’s restaurant set-up allows for plenty of air flow on hot Caribbean nights. 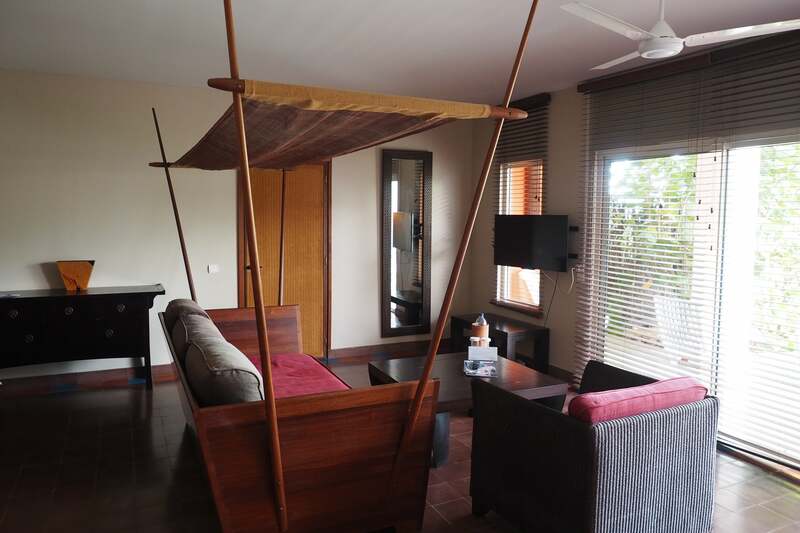 It’s perched above parts of the property so you’ll have a nice view of the beach below while you’re chowing down. To the right of the restaurant is a bar, where I enjoyed a welcome drink courtesy of the hotel management. And now for the reason everyone comes to the Caribbean in the first place — the beach! — which was somewhat small but was never too crowded. 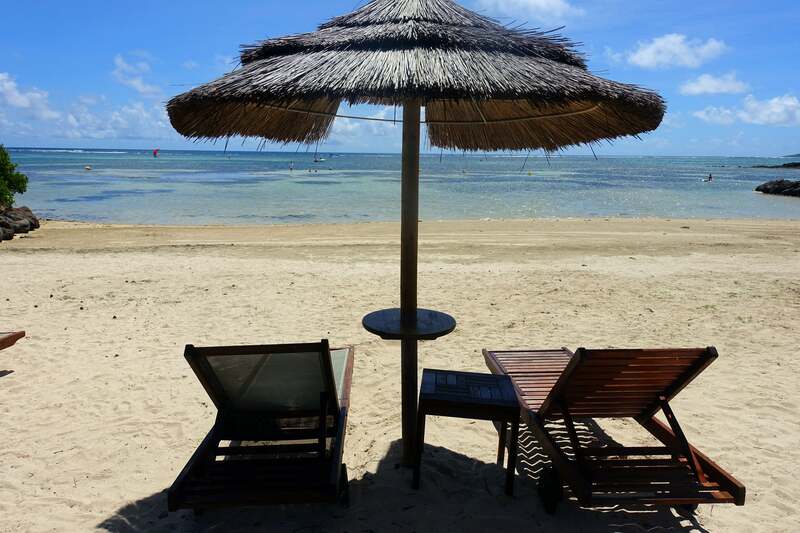 With plenty of seating options and thatched beach umbrellas, it was a great place to catch some rays or enjoy a drink by the water. 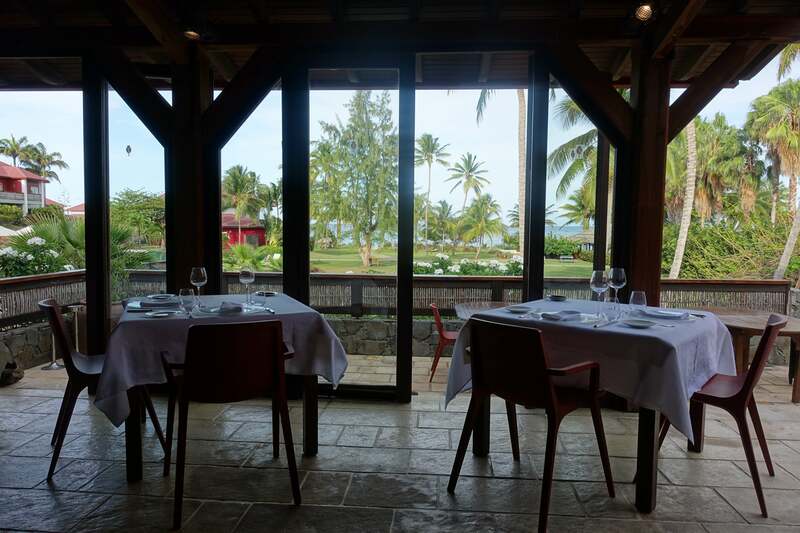 The resort has a couple of dining options but the most popular is the main restaurant, Le Belém, where breakfast and dinner is served — you’ll most likely be eating here a lot, since the resort is pretty isolated and there aren’t any other restaurants within walking distance. 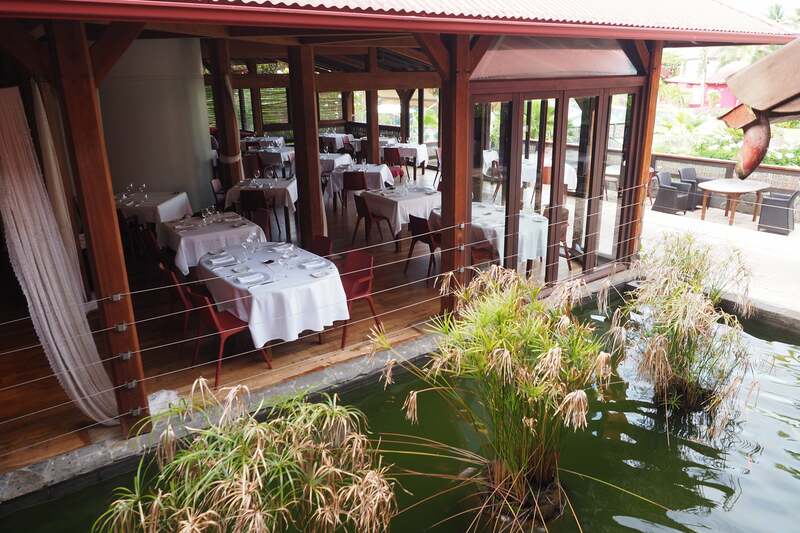 There’s also a small seaside café, Le Campêche, where lunch and drinks are served. Le Belém offered beautiful views of the grounds and I loved starting my day with a hearty breakfast and some coffee while looking at the scenery. Breakfast was served buffet-style, although there was a chef on hand to whip up fresh pancakes or omelets. 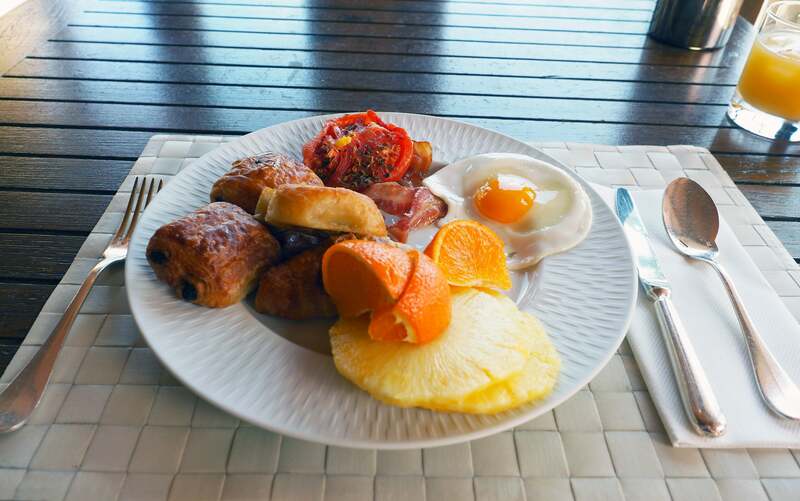 I found the breakfast to be quite good and there were plenty of items to choose from like fresh fruit, pastries, eggs, breakfast meats, tomatoes and a variety of fresh juices. The best part? It’s free, so having a high-quality, complimentary breakfast definitely upped the value of this hotel. Dinner at this resort is treated as more of a fine dining experience, with many of the male guests dressing up in collared shirts and slacks while women wore dresses. I’d give the food a 7 out of 10 since some nights, the food was just okay, while on others, it was spectacular. The service was great, and a few times I was there, the servers gave out free appetizers that were always delicious. 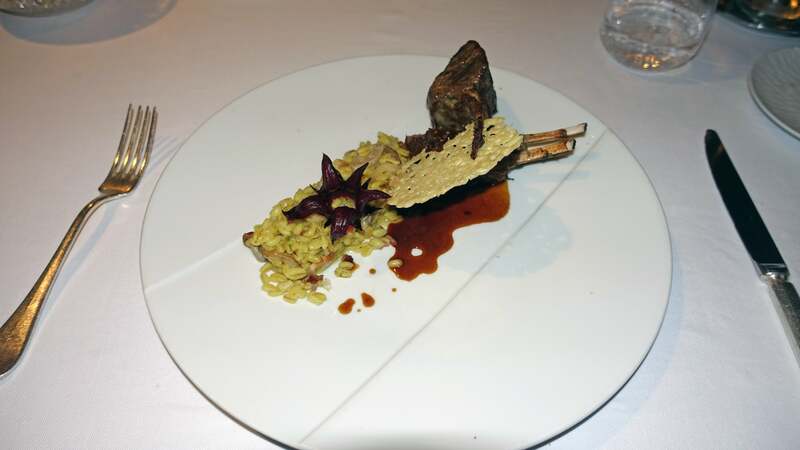 The lamb was fine but many of the portions I found to be a bit small, especially for the price, which was €33 (~$38). 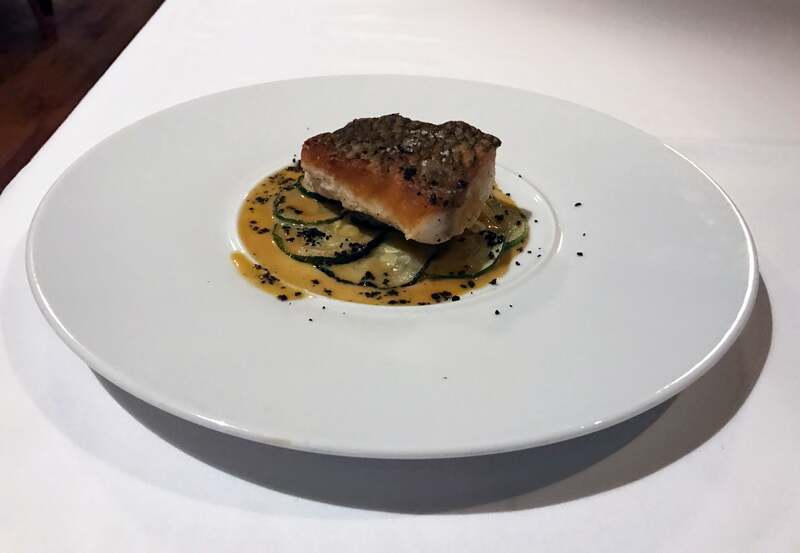 If you only get to try one thing, I would recommend the sea bass fillet for €27 (~$31). Cooked in a sweet fruit sauce to the perfect degree of tenderness, this was definitely the best meal of my stay. 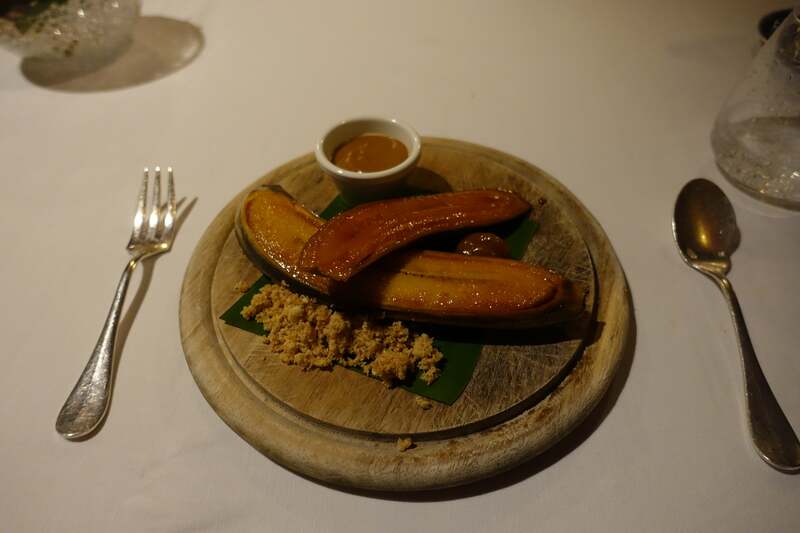 Another must-try dish was the Beigne de Banane, a delicious dessert option that’s a local favorite. Baked in the oven with rum and vanilla and served with a side of brown sugar and caramel sauce, this was a perfect post-dinner snack. The room service menu was pretty decent, with some of the typical food items you might find at an American hotel, like spaghetti bolognese, french fries and steak, among others. 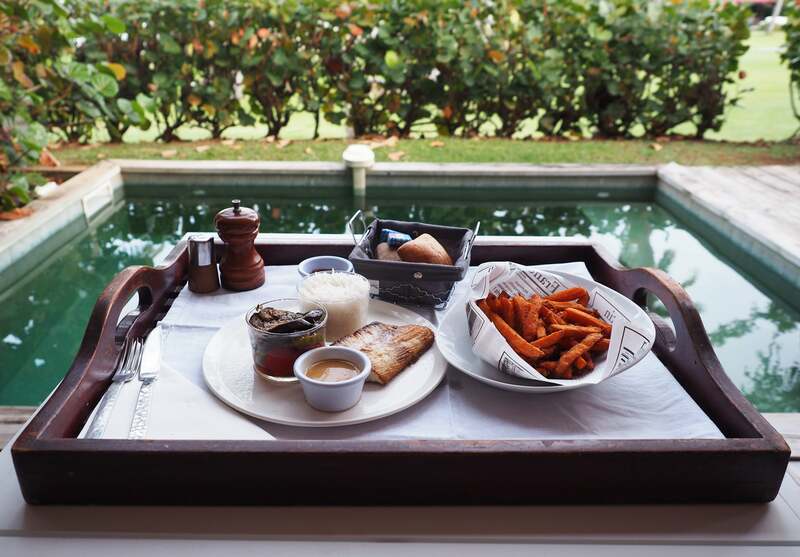 I opted for fish and sweet potato fries, which I ate on the patio next the plunge pool. Of the two room service meals I had, each was served with a basket of fresh bread, which was a nice touch. As a resort, I would say the amenities were just okay. 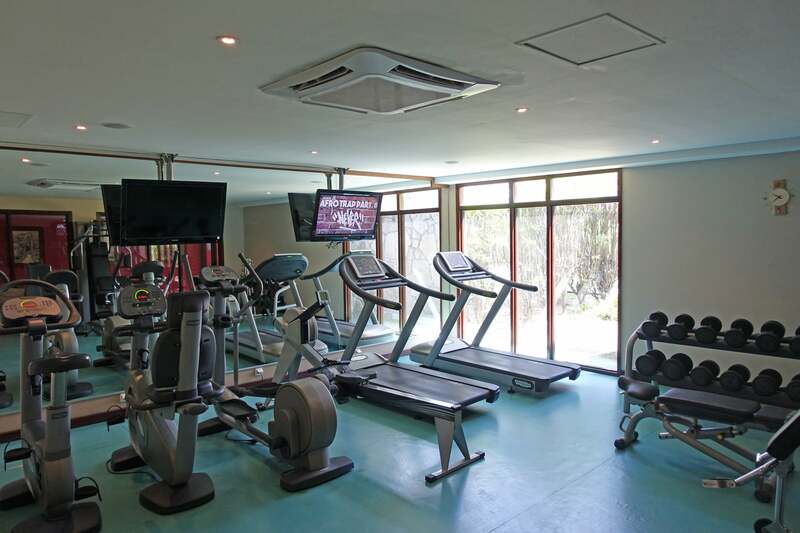 The gym was very small and the equipment felt dated — there also weren’t any towels there, which was a little frustrating. If you’re into tennis, you’ll find a full-sized outdoor tennis court on the northwest end of the resort. 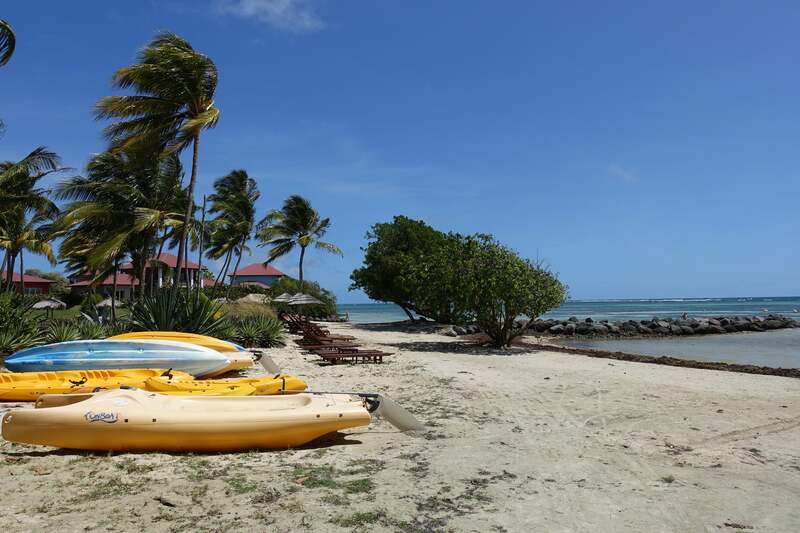 On the bright side, you can rent out kayaks, snorkeling and swim gear from the resort’s beachside shack — all free of charge. 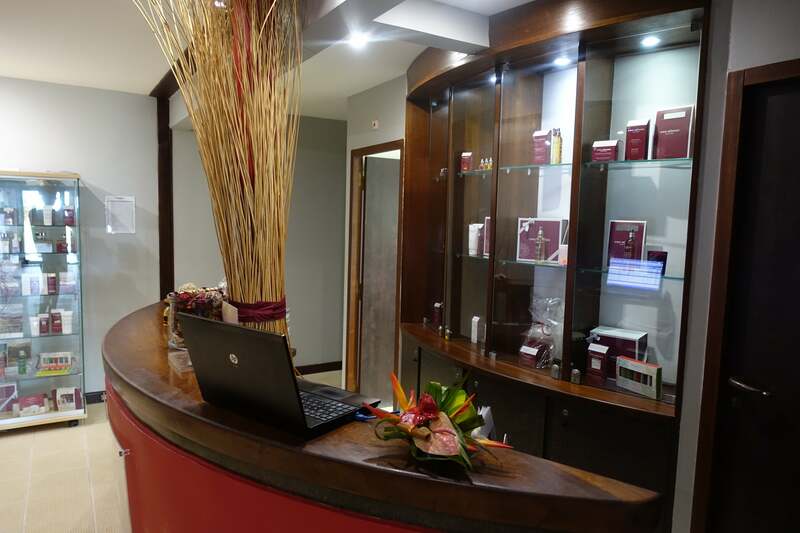 The spa, located adjacent to the gym, was tranquil and had reasonable prices for lots of different treatments. 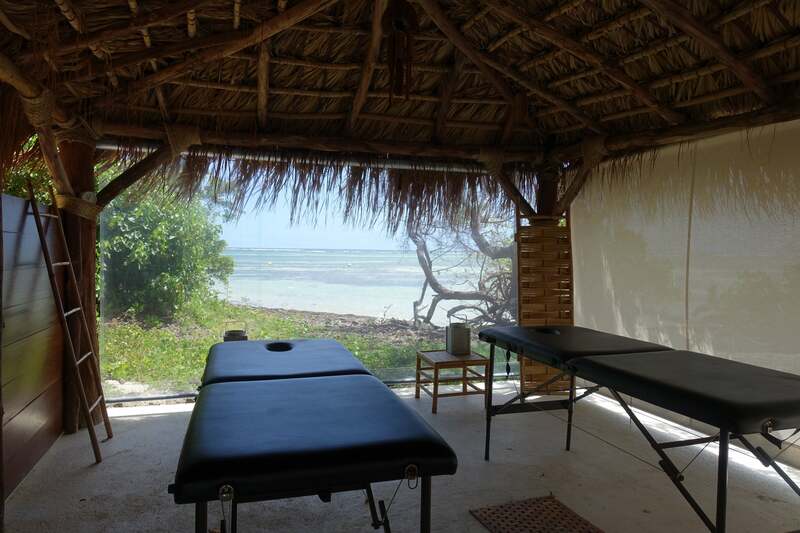 You can even request to get a massage in a beachside tent! Service-wise all the employees at Le Cap Est get an A+. Everyone was super-nice, helpful and spoke English well so I never had trouble communicating. 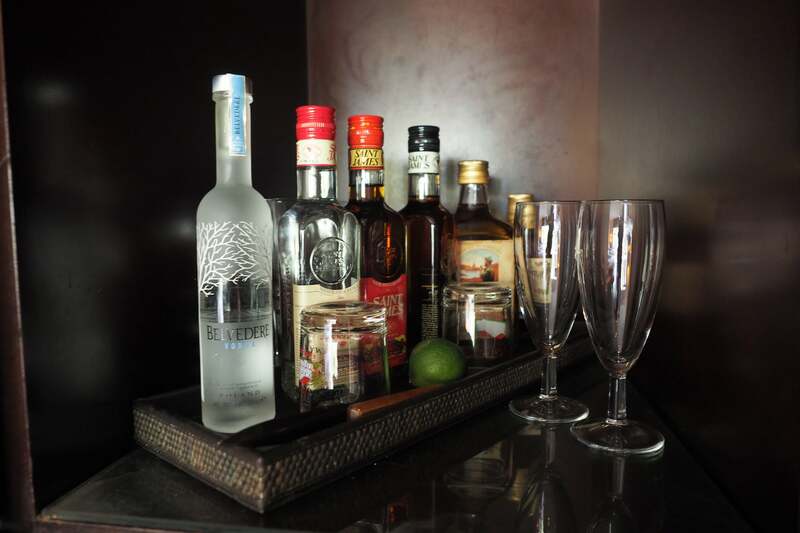 Since the hotel is so small, there was a strong personal feeling — the general manager introduced himself to me at dinner and made sure everything was going well with my stay. When I was on a run outside the resort, I saw a few employees, who all said hi as we passed each other on the rural roads. My room got a thorough cleaning every day and when I realized I’d forgotten to bring my power converter with me on this trip, the staff found one for me to use. Wi-Fi in the room worked relatively well throughout my stay and I didn’t have any trouble streaming my favorite shows on Netflix. I loved staying at Le Cap Est and would definitely recommend it to others. It’s perfect if you’re looking for a quiet beach vacation and I loved the personal touch of the service. The main drawback is that it’s pretty isolated from the rest of the island, so just make sure you rent a car or are willing to shell out at least €60 euros (~$69) for a cab, even if it’s just to get you to the closest village, which is only a 15-20 minute drive away. 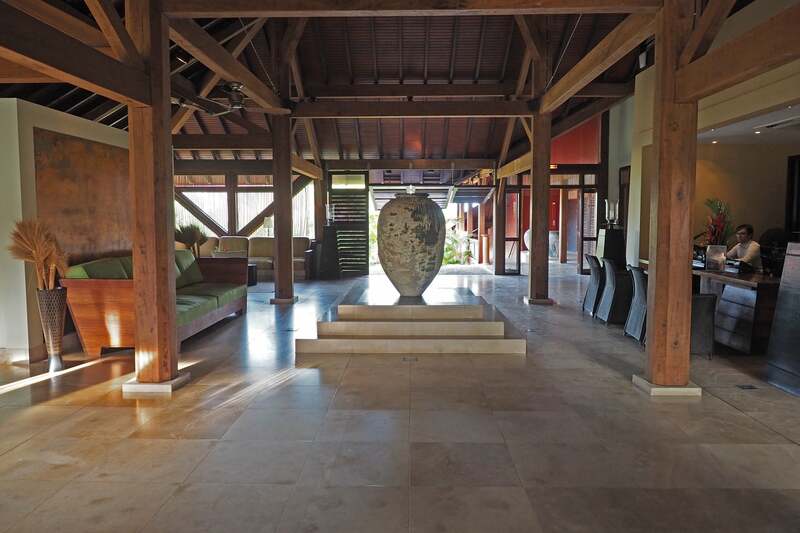 And although some parts of the resort felt a bit dated — like the gym and certain portions of the bedroom — the common areas all felt fresh and meshed well with the rest of the island-style setting. 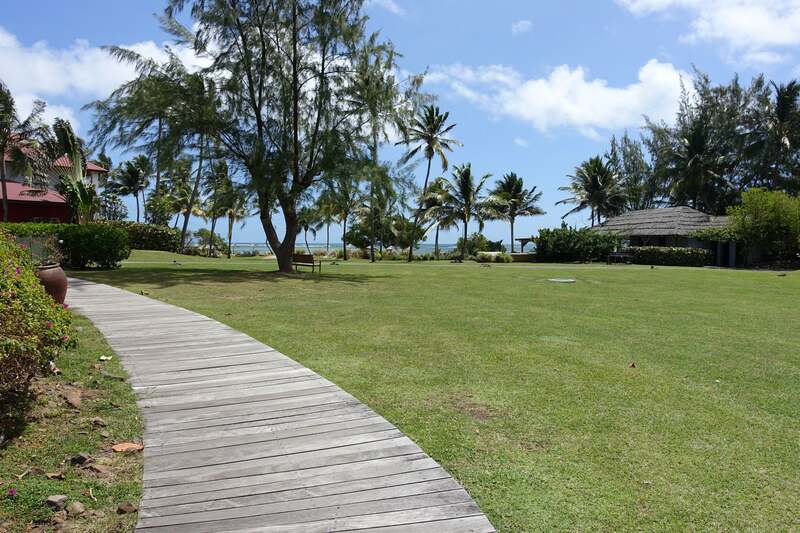 If I ever come back to Martinique, I’ll definitely consider staying at Le Cap Est again. 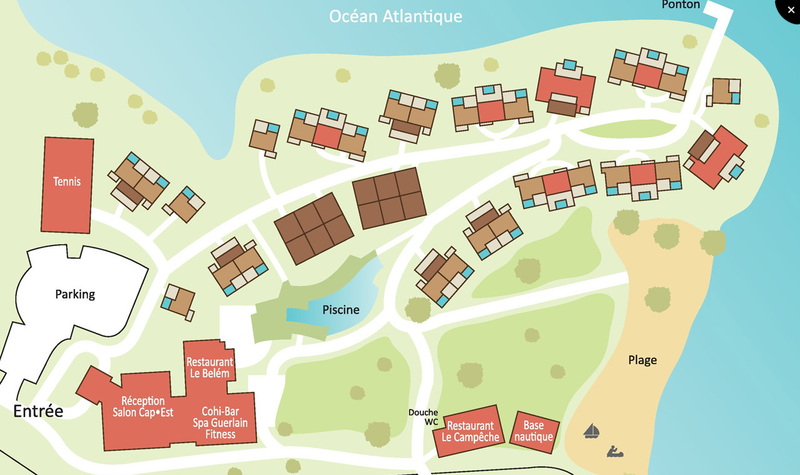 Have you ever stayed at Le Cap Est Lagoon and Spa? Tell us about your experience, below.